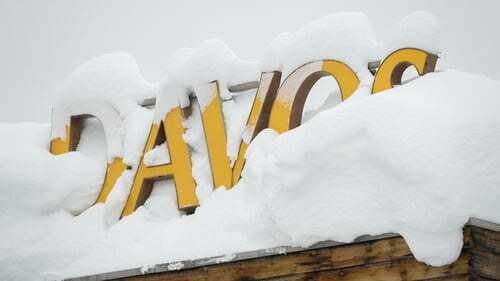 Davos - What's it all about? Davos is shorthand for the World Economic Forum (WEF), which in its original guise was founded in 1971 by German business professor Klaus Schwab as a way for European corporate leaders to learn from their US counterparts. Political leaders started attending later in the 1970s, and since then it has morphed into an annual jamboree where the global elite, joined by intellectuals, activists, celebrities and sometimes protesters, debate the world’s problems. It might be easier to ask who isn't. Among the 2,500 delegates and 70 world leaders, Indian Prime Minister Narendra Modi will be the first of the week's keynote speakers. A parade of European leaders will be there, including Taoiseach Leo Varadkar, Emmanuel Macron of France, Germany's Angela Merkel, Britain's Theresa May and Paolo Gentiloni of Italy. A large contingent is coming from Africa, including Emmerson Mnangagwa, the successor to Robert Mugabe of Zimbabwe, plus a smattering from Latin America such as the presidents of Brazil and Argentina. Influential thinkers such as Israeli "Homo Deus" author Yuval Noah Harari and Harvard psychologist Steven Pinker will be on hand along with Pakistani Nobel Peace Prize winner Malala Yousafzai and celebrities Elton John, Cate Blanchett and the Bollywood baddie Shah Rukh Khan. But top billing has to go to US President Donald Trump, who is due to close the conference with a speech on Friday. His mantra of "America First" is the antithesis of the liberal world order cherished by the Davos crowd – free trade, open borders and respect for cultural diversity. The overarching theme this year is "Creating a Shared Future in a Fractured World". From breakfast seminars to midnight drinks, via film screenings and morning sessions of meditation and yoga, every day is packed. Panel discussions feature leaders from the worlds of business, finance, science and the arts. Many of the panels will revolve around the theme of the "Fourth Industrial Revolution", how to equip today's workers to survive the advent of automation and artificial intelligence. Others will look at geostrategic challenges in the era of Trump, Brexit and identity politics; how to decipher fact from fiction in the age of "fake news"; exploiting machine intelligence in health, and combating "the next pandemic"; risks to high-flying financial markets; making economic growth inclusive; and the future of food. And those are all just on the first day. While only one-fifth of attendees are women, the organisers are keen to harness discussion about the #MeToo movement with an array of panels looking at gender equality. It would be a surprise to find Trump at one of the WEF’s sessions illustrating "A Day in the Life of a Refugee" or joining a Thursday night panel on climate change with former vice president Al Gore. Gore is showing a special screening of the sequel to his global-warming documentary "An Inconvenient Truth". The follow-up is called "An Inconvenient Sequel: Truth to Power". Chilling in a literal sense is not hard in Davos, Switzerland’s highest alpine village where the snowfall has been even heavier than usual this winter. The bad weather has disrupted train and road links from the nearest big city of Zurich. Not that that should unduly bother the VIPs, who routinely take helicopters to access the WEF. If you're a delegate and want to hit the shops, you'll probably be out of luck. Many retail outlets and even a church are handing over their premises – for hefty rents – to corporate clients to use as their base for the week. Other residents are happy to lease out their homes to the visiting jet-set, and hotel rates are astronomical. But for downtime and networking, the WEF is unsurpassed for the breadth of opportunities it gives attendees to rub shoulders with the great, the good and the obscenely (as some would say) wealthy. They can tramp through the snow (or take chauffeur-driven limos) to national-themed buffets, followed by corporate-sponsored cocktails with canapés catered by celebrity chefs, followed by nightcaps touting other companies and countries. Trump's presence has invigorated anti-globalisation protesters. While 4,000 Swiss soldiers and police will keep a close eye on the Davos environs, one group of young socialists intends to rally in the village itself when the US president arrives on Thursday, giving voice to nearly 17,000 people who have signed a petition declaring Trump is not welcome in Switzerland. Beyond Davos, a bigger anti-Trump protest is expected in Zurich. And beyond Switzerland, a group called Fight Inequality intends to contrast the mountain of Davos with the mountain of garbage disfiguring one Nairobi slum with a concert in the Kenyan capital. That is one of several events around the world designed to spotlight the chasm of income and opportunity that lies between the "1%" meeting in Davos and the vast majority of humanity elsewhere.